For those of you who do not know what remote computing is, here is a chance to understand its basic elements. 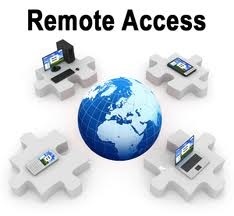 Remote computing is a method by which you can log into a computer or a server kept at a place where you are not physically present. It can be within a building or even in another country. It is widely used in corporate office networks to log on to a system without being physically present at its location. By using this technology one can log into a system as an authorized user or even an administrator of the machine. By using remote desktop software a user can control the computer he wants to control from his desk. User has the permissions to make any changes on the computer and access all its files. There is however a pre-requisite to remote computing and it is to have both master and slave computer on the same network. As far as the computers are connected to each other through the network, remote computing will prevail; it does not matter whether the network is wireless or wired. The first requirement is that the two systems (computers/servers) must be connected over LAN or WAN. Then you need to ensure that the ActiveX Controls in Internet Explorer is configured. After this configuration, you need to tune the security settings to your liking on the browser. The next step is to install all the required Java Plug-ins. All this done, then you need to open the required ports so that you are able to control the computers and even transfer files between them. This is the last tuning job after which your computer will be ready to be configured for remote computing. If you are using a Windows OS then in order to use Remote Desktop feature you should have at least Windows XP service pack 3 installed. Window OS above this have in built feature of remote computing using Remote Desktop Connection client. This software however will only support the computers running Enterprise, Professional or Ultimate versions of the Windows OS. If you are a Mac OS X user then you will have to separately purchase the Apple Remote Desktop Software which also is designed like the Windows variant to work on business networks. Linux users have a variety of options to choose from when it comes to remote computing software. Basic access of remote network enables users to read and edit files on the target without using Remote Desktop software also. For instance, VPN technology enables remote file access across a WAN. All it needs is the client software to be installed on the host computer along with the VPN technology present on the target. Alternative to VPN include client /server software that are based on SSH protocol. It provides the user command line system into the target computer. LAN or home networks that are used to share files are not considered as remote computing environment. The author, Ethan Dean, is a successful freelance writer. He enjoys blogging about computers and softwares in his spare time. You can get more information about 100TB dedicated server hosting and the services offered by them on their official website.